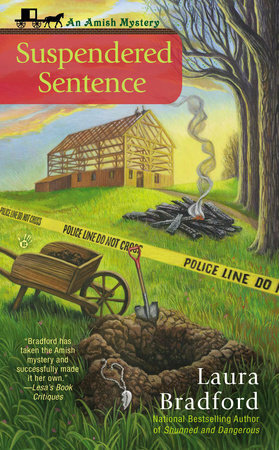 In this addition to the Amish Mysteries, Jakob's friend comes back in town and is murdered. He and Claire soon find that things are not as they seem–and that his friend may have stumbled into something sinister before he was killed. Sign me up to receive news about Laura Bradford. 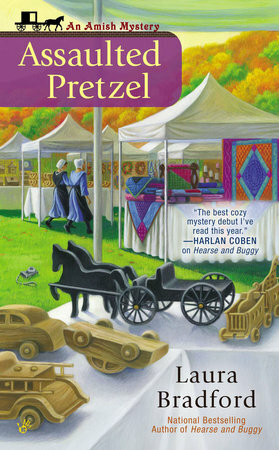 Another great entry into the mystery series, which explores the fringes of Amish life and culture. Bradford does an excellent job continuing to develop the world of Heavenly and exploring how the mixture of Amish and English culture can cause issues. Claire Weatherly is dating detective Jakob Fisher, but she has never met Russ Granger, the man Jakob counts as a mentor and father figure. Of course, that is because Russ has retired and moved to Florida. He is back in Heavenly, Pennsylvania, for a visit, but before Jakob and Russ can reconnect, Russ is murdered. Devastated by Russ' death, Jakob throws himself into solving the crime. Can Claire help him come up with any leads? Bradford has built a community in Heavenly. The characters in this series become important to returning readers. We care about Claire and Jakob, and we want to see good things happen for her friends and family members. Just Plain Murder is an intricately plotted, character-driven story that welcomes readers back to Heavenly. This is another well-plotted story from Ms. Bradford, even though at times it seems to be a bit slow. The residents of Heavenly are wonderful and well developed and the interaction with the Amish community is well done. This was my first time reading a book from this series and I truly enjoyed it. I was pulled in from the beginning and didn't put it down until the end. The characters and setting captured my attention right away and the mystery kept me going from there. After the first few chapters I was able to get a sense of who the characters were, I felt like I knew who Claire and Jakob were by the end. I liked the way they worked together as a team and their relationship felt like a true connection. Claire was truly the anchor that Jakob needed in this read after the murder of the man who changed his young life. After reading this book I will definitely be going back and reading the previous books. I liked learning about the Amish way of life and this book was a great source of information. You could tell the author did quite a bit of research that led the book to its authentic feel when it came to all things Amish. I look forward to seeing where the author takes these characters next! This was a quick read for me although I enjoyed it. If you like clean romance then this is for you. The story was had some predictable things, but I liked the characters and the mystery part was interesting. I am curious about the next chapter in their lives. I’m looking forward to future books in this series and I highly recommend this book. I received a free advanced copy of this book from First to Read in exchange for an honest review. This was the first book in the Amish Mysteries series. I feel like the previous books need to be read in order to get the background of the characters. I felt like I was missing something without having read them. The plot sounded interesting but it was slow moving. 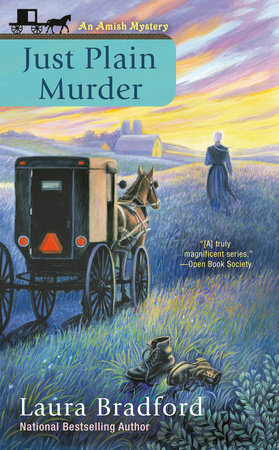 I love this series (An Amish Mystery) and thought that this was a pretty good book. It would probably be a good idea to read the previous books in the series to get an idea of who some of the characters are and get an idea of how these stories generally go, but it's not necessary. Former Amish turned police detective Jakob learns that his mentor/former police detective has been murdered and he feels it's his duty to find out who did it. Girlfriend Claire helps him work through a few theories about who did it and why. While working together, they realize that even though there is stress from Jakob trying to find the murderer, they can overcome any obstacle as long as they communicate with each other. Unlike most books, I wasn't able to figure out who did murdered the mentor/former detective until the end of the story. 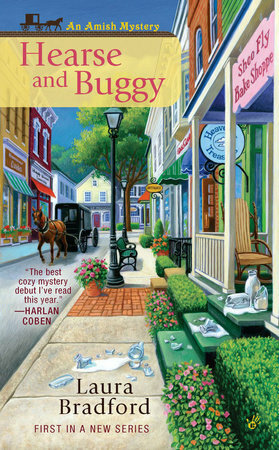 I love me a cozy mystery and I was intrigued by the premise. I'm going to state the obvious and say with this series it will be beneficial to have read the previous books. Other cozy mysteries you can jump into a few books in, but the reader would do well to read the previous books. Generally speaking, I liked the characters and the town seemed charming, but I found the story lacking. The ineptitude of the police work was frustrating and the plot was very slow-paced so I found my interest waning. There were a few sections where I skimmed since I was getting bored with the story. I wish I had liked this more and it seems it is a popular series, but it wasn't my cup of tea. First, the good things: Even though I don't usually read this type of book, it had enough interest for me to read it through in a day. Some of the description was over the top, especially at the beginning, but later on it settled and gave me a good sense of story placement. Also, the SURPRISE ending was wonderful. And I like the way cookies are threaded through the story. That's always a fun thing to have in a book. No matter what genre I read, I base reviews on whether the book kept me in the story. For the most part this one did, but there were a few instances where I was jolted back to reality. Some of the instances turned into being references to back stories. I didn't realize until about page 60 that this was a book in a series. Perhaps the author could do more about filling in the back story if there is one, for first-time readers. Some examples: 1. Page 26: "Annie's horse." Who is Annie? I found out later in the book, but this made me go back to the beginning of the book to see what I had missed. 2. Page 58: ". . . the small handheld mirror she still kept beside the register even though Esther was no longer working at the shop." 3. Page 60: "Will you dress up again to catch the person?" This is when I realized there must be other books in the series. It's good to tie past books into the present, but enough information should be given so first-time readers aren't scratching their heads. 4. Page 201: Who is Josiah Beiler? 5. Page 228: Who is Saide Lehman? There were also instances or sentences that didn't make sense, which took me out of the story. Some examples: 1. Page 15: ". . . blinked back the same tears she'd been unable to hold at bay during Esther's unexpected delivery." How could they possibly be the SAME tears? 2. Page 24: "She tasted the saltiness of his single tear as he buried his head in her shoulder." Does her shoulder have taste buds? 3. Page 25: "A few steps past Glick's, Jakob's continued silence marched to the forefront of everything else." ???? 4. Page 25: "And then he was gone, any residual background sounds muted by the rhythmic clip-clop of the horse pulling into the alley just ahead and the end button on the detective's phone." ??? Maybe end sentence at "just ahead." 5. Pages 38 and 278: What are Eli-length beards? Don't make me have to google this. It takes me out of the story. 6. Page 63: "You. Are. A. Genius." and page 146: "Every. Single. Time." People text and post like this. They don't talk like this. 7. Page 166: "The name disappeared behind Laurie's palm as she lowered herself onto the bench . . ." What does that mean? Problems with the plot: This was a former police chief who was murdered. You'd never guess it from the way the case was handled. Fingerprints? Tire tracks? Foot prints? None of this was mentioned until late in the book. Most towns would have had a TON of people on a case like this, even if it had been 10 years since he had been chief of police. The idea of getting the videos from the bar's cameras didn't occur until very late in this case. That would have been a no-brainer in most books telling of murder. And the phone! You can't get into a phone without a password, fingerprint, or face recognition. But Jakob got right into Russ's phone, even though they hadn't seen each other in years so there's no way he'd have his password. Hot wings: People who serve and eat hot wings know that water is the worst thing you can drink if your mouth is on fire. You should drink milk or alcohol, or eat bread or chocolate. Maybe chocolate milk with a hit of Bailey's Irish Cream and a good loaf of bread? :) But these points aside, anyone who enjoys this genre would enjoy this book. Laura Bradford brings the community of Heavenly alive with Claire and Jakob in Just Plain Murder. Although, it was a quiet start and a little foggy as to where you were headed it was a charming read. It does ok as a stand-alone but I will be checking out the first of this series. Thank You First to read for this opportunity. This is the first book I have read by this author. For me, it was just okay. There was something missing. More action throughout the story, perhaps. It really did not hold my interest. I was glad when I finished the book. Now as you see the title of this book it is the sixth in a series, but the first that I have read, and it didn’t take much to be caught up and involved in the lives of these English and Amish in Heavenly. The author offers us a story with a bit of romance, family love and comradery, with a glimpse into Amish life, and unfortunately a murder. Right to the end of the book you really don’t know how things are going to turn out, and I never saw the ending coming. Now I want more, I want to move on with Claire and Jakob, and more of Diane and Bill, and now I am looking forward to another read in this series! I received this book through First Reads, and was not required to give a positive review. Not really my kind of book. Had wanted to try a book about the Amish but found it lacked “depth”.....characters, plot. This is the first book in this series and I really enjoyed it. It is a book that does just fine as a stand alone although I think I would really enjoy the rest of the series. This book introduces a number of intruiging characters in the community. It's a great cozy mystery that keeps you guessing. I will definitely look for more books by this author. First, I loved the cover for this mystery. Laura Bradford revisits the tranquil town of Heavenly, an Amish community, but the serenity is destroyed with the death of retired cop Russ. The death hits Jakob hard as Russ was his mentor. With the aid of girlfriend Claire, the two investigate all Possibilities and withe the help of an errant Amish teen, they crack the case. 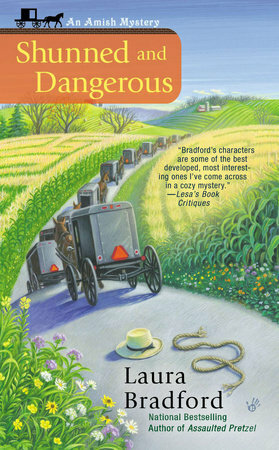 Bradford always paints a delightful Amish community picture with her stories. Nothing wrong with this book, it just wasn’t for me. I prefer the Kate Burkholder series by Linda Castillo. That series also has a main character from an Amish background but is more of a police procedural rather than a cozy. When I received an ARC of this book in exchange for an honest review, I did not realize it was part of a series. However, it reads well as a stand alone book. I thoroughly enjoyed it and will be looking for others in the series. Possibilities are open with the love interest for Diane arrives. Would like to see what develops. While the resolution of the murder was a little dark, in the end the puzzle was completed and all ended well. I liked the information about the Amish and their ways. Highly recommend as time well spent. I thoroughly enjoyed this book without knowing it was part of a series. I did have questions as I was reading as to why Jakob's Amish background and him leaving that community was not explained. I would definitely look into reading the beginning of the series to get a better understanding of Jakob's background and how he and Claire got together. So many questions would be answered. Not knowing the beginning should not stop you from reading this book. I highly recommend it. This story felt darker in tone than the earlier books in the series but it I still enjoyed it. We really get to know Jakob much better in this book and I like that Bill has been brought back as a love interest for Diane. I hope there will be many more books in the series. Just love this series. In this book, Jakob is getting ready to introduce Claire to his mentor Russ Granger and former police chief of Heavenly. It is Russ who helped Jakob become a police officer and help him over the years. When Claire and Jakob are out on a picnic, he receives a call that Russ has died. It is learned that Russ was murdered, however, there appears to be no motive or any suspects. Claire tries to help Jakob as best she can by supporting him thru his grief and passing along comment and offers of help from others. In the Amish community, a new bishop has been elected and they are dealing with a rather wild teen on his Rumspringa. He is the neighbor of Eli and Esther and has been causing lots of issues in the neighborhood. The mystery to solve Russ’s murder is filled with lots of red herrings and initially going thru old case files to see if anyone had a grudge. This was a fast read and am glad to see the growth in Jakob and Claire’s relationship along with the return of Bill perhaps a new long term character and love interest of Aunt Diane will stay in town. Benjamin even has a new love interest and we should be seeing more weddings in the future. Looking forward to the next installment. Highly recommend.